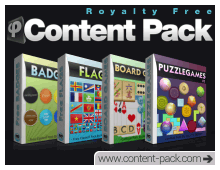 Royalty Free Content Packs - We supply the sprites, you supply the games! Royalty Free Content Packs is a marketplace to download affordable game art and many other ready-to-use graphics related to game development for both commercial and personal productions. Subscribe to our newsletter – 3282 royalty free sprites + 10 backgrounds and counting! This freebie contains 5 folders of 249 files each in .png format + country names/ISO 3166-1-alpha-2 code. This freebie contains 10 files in .png format featuring 10 badges of 256 pixels X 256 pixels (text free). 8 icons (256×256) : The eight members of the G8 are Canada, France, Germany, Italy, Japan, Russia, the United Kingdom and the United States. This freebie contains 8 files in .png format. 8 buttons + 1 title + 3 social media icons + 1 cursor. 13 sprites in a 1024×1024 sprite sheet. If you want eye-catching prototypes without paying too much. This pack contains 12 files in .png format featuring 270 sprites (10 Sprite Sheets) + 2 backgrounds. This pack contains 9 files in .png format featuring 137 sprites (8 Sprite Sheets) + 1 checkboard. This pack contains 6 files in .png format featuring 98 sprites (5 Sprite Sheets) + 1 background. This pack contains 7 files in .png format featuring 106 sprites (6 Sprite Sheets) + 1 background. This pack contains 1 file in .png format featuring 74 sprites (one 2048×2048 Sprite Sheet). This pack contains 1 file in .png format featuring 92 sprites (one 2048×2048 Sprite Sheet). This pack contains 3 files in .png format (2048×2048 each). This pack contains 2 files in .png format featuring 585 sprites + 2 tables (green and blue cloth) / 2048 x 2048 spritesheets. This pack contains 7 files in .png format featuring 230 sprites (7 Sprite Sheets). This pack contains 1 file in .png format featuring 91 sprites (one 2048×2048 Sprite Sheet). This pack contains 1 file in .png format featuring 102 sprites (one 2048×2048 Sprite Sheet). This pack contains 5 files in .png format featuring 450 sprites (five 2048×2048 Sprite Sheets).